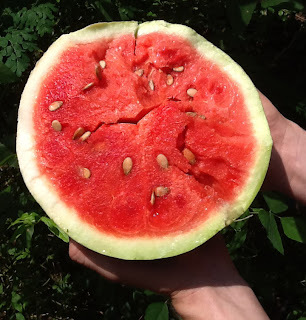 Florida Survival Gardening: Today at the 326 Community Market: Watermelon Festival and $16 Fruit Trees!!! Hey folks - it's WATERMELON FESTIVAL time! That's right... this week at the 326 Market there will be sack races, seed-spitting contests and all kinds of watermelon-related craziness. Bring the whole family and prepare to have fun! At my booth I have peaches, pears and Japanese persimmons for just $16 a pot right now. These are young trees but are plenty big for planting - and at a price you'll find hard to beat. I also have - wait for it! 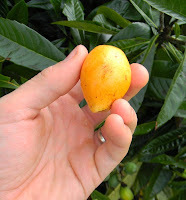 - ONE, nice, big improved loquat tree for $30.00. First come, first serve. The cultivar is "Wolfe." There's a little write-up on this cultivar here that states "'Wolfe', (S.E.S. #4) (a seedling of 'Advance' selected and named at the Agricultural Research and Education Center of the University of Florida in Homestead, and released in 1966)–obovoid to slightly pear-shaped; 1 3/4 to 2 in (4.5-5 cm) long and 1 to 1 1/4 in (2.5-3.2 cm) wide; yellow with fairly thick skin and pale-yellow, thick, firm, juicy flesh of excellent flavor, acid but also sweet when tree-ripe; has 1 to 5 seeds (usually 1 to 3). Tree reaches 25 ft (7.5 in) and bears well nearly every year." I also have large-fruited prickly pears, some bananas, chaya, goji berries, soap-nut trees and more. And - in related news - my friend Donna will be setting up her booth for the first time this week and selling some of her amazing homemade soap. Be sure to say hi to her as well. Beyond what I carry, there are also folks selling melt-in-your-mouth Florida peaches, goat milk cheese and soap, delicious ice cream (from actual hand-milked cows), crafts, vegetables, baked goods, homemade jams and jellies, ornamental plants, homemade birdhouses and more. Just wanted to share a tip about goji berries. Last fall I moved my goji berries from full sun- where they had really been struggling and had barely grown in over a year- to a spot with late afternoon shade and sometimes irrigation. Same soil- Florida gray sand heavily improved with composted chipped trees and occasionally chicken manure. They are so much happier now! They've actually produced enough berries that I had to bust out the dehydrator. Thank you! Very good to know. Thanks for your advice. What county in FL are you in? Goji Berries are on my wish list.